I have owned a personal computer since 1985. After typing term papers on a manual typewriter, where edits beyond typos meant retyping an entire page, using a word processor was a huge time saver. Since then I have continued using computers for typing papers, reports, forms, letters and, since the internet became available, emails. So when I began writing my stories, I naturally typed them on my computer. I type faster than I write, so it made sense to get the words out of my head as quickly as possible before I forgot them. But, it turns out, typing my initial drafts doesn’t work for me. I find the physical act of writing on paper works much better. Seeing the words form from my hand somehow helps my thoughts flow better, and somehow, my handwriting is able to keep up. Here’s how I currently write, the method that works best. I handwrite my first drafts on legal pads. I like having lines so I can write fast and not slope to the edge of the page. I leave every other line blank to make it easier to read, and to allow room to write edits. 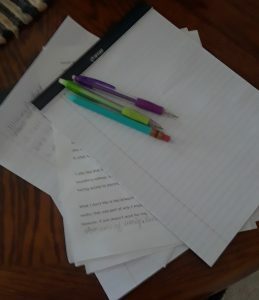 Until this summer, I always wrote with a pen. Because of arthritis in my thumbs, I used rollerballs since the ink flow is smoother. Of course, that ink also easily bleeds through paper and can make a mess if it gets wet. Then I heard Danielle LaPorte say she used a mechanical pencil with a larger size lead to write in her planner. And the light-bulb went off in my head. I bought a couple of mechanical pencils and found the 1.3 mm lead worked well for me. It flows across the paper, can be erased if needed, and is easy on my fingers. After I complete the first draft, I read through it, making notes and edits on the blank lines and the margins. Then I handwrite the 2nd draft, and edit again. By this point I am usually ready to type it on the computing, editing as I go. I double-space the text so I can print a copy to read aloud and edit by hand. Yes, I want a physical copy to edit; that’s what works for me. An added bonus for me is that the paper-and-pencil method is portable. I can write from anywhere without having to carry a computer, worry about batteries dying or having access to electricity. The biggest negative for me is the amount of paper that I go through. I hate to waste anything, and all that paper I use seems like a waste. That was part of why I tried drafting on my computer, to save paper. However, it just doesn’t work for me, and I am learning to be OK with it. I’m not the only one that finds value in writing by hand. Here’s another writer, TE Shepherd, who also drafts by hand, and in this article, he talks about why it is beneficial to do so. Then this article from the Huffington Post delves into how your brain benefits when you write by hand. Writing by hand may not be the best method for everyone, but I encourage you, whether writing professionally, for fun, or just keeping a journal, to try writing by hand. See the results then decide whether or not to continue. I may even change my system as time goes by. But for now, I’ll always have a supply of legal pads and mechanical pencils close by. Note: This post contains affiliate links. If you click through and make a purchase, I may receive compensation.